Peer collaboration fosters student response and learning in important ways. When students collaborate in constructing meaning from text they have “multiple resources at the reading [writing] construction site” (paraphrased from Kucan & Beck, 1997). The ‘more knowledgeable other’ in such learning situations shifts and is distributed among group members. In collaborative learning situations, students acquire windows into the thinking processes of others and in so doing they both acquire knowledge and the processes by which such knowledge is constructed. The use of digital tools and apps allows students to collaborate synchronously and asynchronously. Students can research information and post their findings and annotations for others in the group to review. Members can then interpret, critique and synthesize information from a variety of online sources. Digital tools and apps that are useful to foster collaboration include Diigo, Subtext and Evernote. These digital tools and apps are portable across multiple devices and platforms. 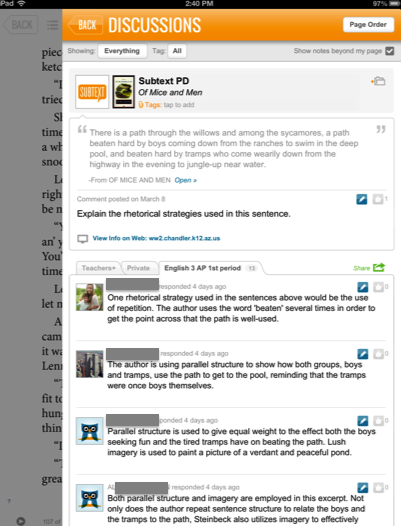 The Subtext app (currently available free on ITunes with a version for Android promised soon) allows students to annotate an ebook or website with questions and musings in the malleable moments of online reading. Students can share their ebook annotations with peers. Teachers can also set up private groups in their classrooms and embed instructions, layer weblinks, videos and assignments on the ebooks. There are a number of useful formative assessment tools, classroom management tools and social media-like features built into the app. Subtext is integrated with Google Drive and students can copy their highlights and notes into this medium, thereby closing the lines between reading and writing. See the example from the subtext website. Evernote is a popular ‘Remember everything’ app to create and share digital notes and thinkmarks. You can also record audio notes with ease to share with others. Capturing class notes from an Interactive Whiteboard is another useful strategy for students. Another interesting feature is the ability to clip or capture websites and create annotations on the clipping. Watch the video embedded below from the Evernote website if clipping websites with Evernote is something you are not familiar with. Again these notes can be synchronised across muliple portable devices. Kucan, L., & Beck, I. L. (1997). Thinking aloud and reading comprehension research: Inquiry, instruction and social interaction. Review of Educational Research, 67 (3), 271-279.